This week (October 11-15, 2015) is Healthcare Security and Safety Week. The International Association for Healthcare Security and Safety (IAHSS) established this recognition week to highlight the role of security and safety personnel in healthcare facilities. Individuals serving as healthcare security and safety personnel often seem like they are working in the periphery of the healthcare environment - unless the security officers are called to respond to an incident or the safety officer arrives to assist with a chemical spill, you might not notice the valuable work they do to enhance the Environment of Care (EOC). IAHSS has developed a few key messages associated with Healthcare Security and Safety Week, but I wanted to "flesh out" some ideas about how security and safety team members can be assets to a healthcare organization. Hospitals and other healthcare organizations are ostensibly in the business of helping people to improve or maintain their health. Safety and security team members frequently embrace the more practical aspects of service to patients and clinical staff. Security and safety team members frequently remind staff members, contractors, and physicans to conduct their healthcare-related work in a way that reduces exposure of coworkers and patients to unnecessary hazards. 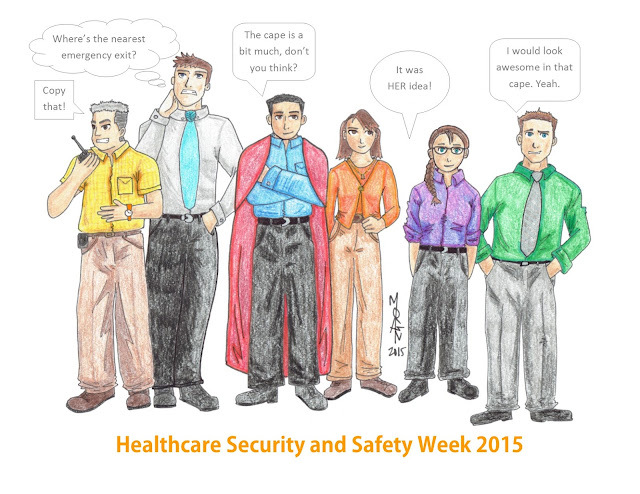 Celebrate Healthcare Security and Safety Week with the team from your hospital!